As we continue to develop and finalize our custom made solutions to our respective clients, it is important to be aware of the sustainability of these devices. How can we create something that will support them in the long run? Self-efficacy could be one principle to foster sustainability. According to Bandura (1977), self-efficacy is the belief that one can perform adequately in a particular situation. It reflects confidence in the ability to exert control over one’s experiences. If our clients are confident in their ability to use their assistive technology, we can expect sustainability and attainment in the face of obstacles and aversive experiences. 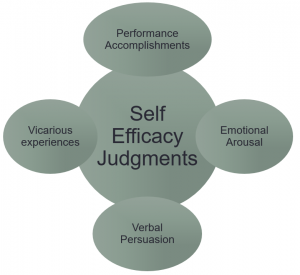 Albert Bandura’s self-efficacy theory demonstrate four key mechanisms to improve self-efficacy. 1) Performance Accomplishments: Success raises mastery expectations; repeated failures lower them. After strong self-efficacy expectations are developed through repeated successes, the negative impact of occasional failures is likely to be reduced. 2) Vicarious Experience: Seeing other people perform activities without adverse consequences generates expectations in observers that they will improve if they intensify and persist in their efforts. 3) Verbal Persuasion: People can be socially persuaded that they possess the capabilities to master difficult situations. 4) Emotional Arousal: Diminishing emotional arousal (i.e. anxiety, stress) can reduce avoidant behavior. If we allow our clients to: have success in using their AT; see someone model AT without any bad implications; know they have the talent, skill, and knowledge to use the AT; and feel safe and comfortable, we can ensure success and sustainability for our clients. Reference: Bandura, A. (1977). Self-efficacy: Toward a unifying theory of behavioral change. Psychological Review, 84(2), 191-215. This entry was posted on Monday, October 19th, 2015 at 12:06 am and is filed under Uncategorized. You can follow any responses to this entry through the RSS 2.0 feed. You can leave a response, or trackback from your own site.